Electricity and Electronics for Renewable Energy Technology: An Introduction provides a foundational understanding of electricity and the methods and devices specific to electricity from renewable sources. A lab manual and PowerPoint presentation are available with qualifying course adoption. Featuring extensive review questions and practice problems at the end of each chapter, Electricity and Electronics for Renewable Energy Technology: An Introduction instills an essential knowledge of electricity and electronics required for work with renewable energy. Ahmad Hemami is an adjunct professor at McGill University, Montreal, Québec, Canada, and a professor at Iowa Lakes College, Estherville, Iowa, USA. He holds a BS from the University of Tehran, Iran, and a Ph.D from the University of Salford, UK. Dr. Hemami’s extensive experience includes teaching, engineering practice, and research. He has taught several undergraduate and graduate engineering courses, supervised numerous MS and Ph.D students, served as an industry consultant, and published his research in more than 100 journals and conference proceedings. 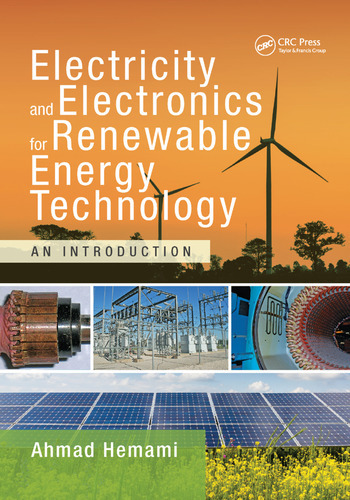 "… a really great introductory textbook and an ideal support for undergraduate and graduate courses in renewable energy systems, electrical engineering, and electronics. The fundamental principles are clearly and expertly explained and the effective use of examples peppered throughout the text makes this an interesting and enjoyable learning tool. The scope is broad, ranging from a discussion of the supporting mathematics and materials science to components and systems, and as a result the reader is given a good grounding in the basics while at the same time getting exposure to major topics." "… great information about energy and electrical systems. We will definitely consider this book for our fall 2016 class cycle. It is great to see a book with so much information about renewables in one place." " … the major strength of the book is that this book delivers the material in a very simple way that everyone can understand the topic; yet it is very detailed that even a beginner student can be very competent on the subject field. All the schematics and diagrams used in this book are very descriptive and they speak for themselves. Even a very difficult to understand concept that is hard to imagine is delivered successfully with the outstanding diagrams used in the book. I haven’t seen a better alternative so far. I think diagrams used here are the best ones if you don’t have the opportunity to see the real thing."